Juvenile Bedding from Sleepcare, Inc.
Juvenile Bedding & Mattresses from Sleepcare, Inc.: Crib Mattress, Cradle Mattress, Youth Bed Mattresses & Captain's Bed & Trundle Bed Mattresses. 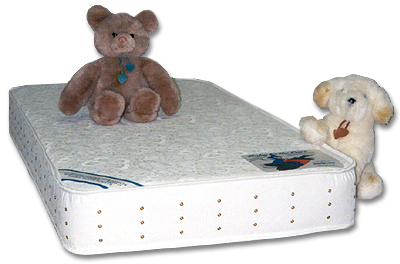 Crib Mattresses: Standard size is 27" x 52" x 6". We make them in innerspring or foam and have designed both these constructions to provide firm, healthful support for baby's first bed. Both are made with our famous Airlet border - 100 brass eyelets around the border perimeter aerate the mattress interior, keep it clean fresh always. Covered in white embossed washable vinyl. Cradle Mattresses: For some parents, the bassinet is selected for newborns and these vary greatly in dimension and shape. However, with your paper template we'll make your baby a cozy, comfy little bed to dream away the hours until it's time for a crib. Youth Bed Mattresses: There is a point in time (which comes around before you know it) when the original occupant of the crib needs some stretch-out room. Sleepcare has the answer: 33" x 66" Youth Bed Mattress. Available in medium density foam, this model is covered in a durable stripe mattress ticking. Captain's Bed & Trundle Bed Mattresses: Manufactured to standard twin size 38" x 74" dimensions and 5" thick long wearing, resilient innerspring or comfortable back supporting, high density Flextron� foam. Many trundle mattresses must be made to fit the pullout drawer so we'll customize your mattress to your measurements. mattress, mattresses, matress, mattres, bed, beds, bedding, residential, healthcare, hospital, hotel, manufacturer, Freeport, Nassau County, Long Island, LI, L.I., New York, NY, N.Y., discount, wholesale, retail, factory, direct, antique, electric, sofa, sofabed, youth, crib, baby, cradle, juvenile, captain's, trundle, innerspring, foam, factory, pressure, medical, firm, replacement, odd size, postureflex, side support, queen, kingElectric, adjustable, replacement, twin, full, cal-queen, cal-king, super single, Murphy, college, fireproof, fire-retardant, hi-flex, visco-elastic, bacterio-static, Nycron, Flextron, Nordicor, Relieflex, Backrest, bunky board, day bed, memory foam, fine, finest, quality, 5 Boroughs.